This is the second part of a 2 part series examining some of the biggest silver stackers of all time. In part 1 we reviewed three past silver bullion buyers who at various times acquired the most silver bullion in the world. In this part 2, we examine today’s documented silver holdings and sales records to assess where the largest silver holdings currently reside. 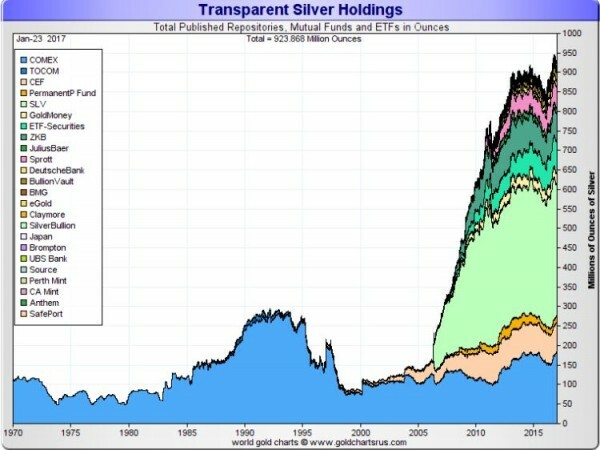 Today’s total transparent silver investment funds and exchange depositories now hold just over 920,000 million ounces of silver. Close to 1 billion ounces of silver may sound like a lot but compare that to a world with over $260 trillion in verifiable assets. About $20 billion in silver value, or 1 part per 13,000 is next to nothing. Silver is a very small market indeed. 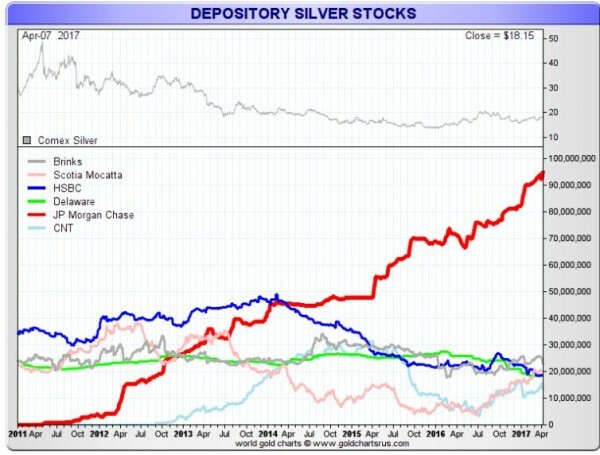 In progression from today’s largest known silver hoards is (3rd) JPMorgan’s silver warehouse inventory used on the COMEX, (2nd) the iShares ETF called SLV of which JPMorgan is custodian of and (1st) a surprising yet often overlooked growing entrant in today’s silver bullion stacking frey. More on them all later. According to the World Silver Survey, annual world silver supply is also about 1,000,000 ounces per year. The vast majority (about 80%) of silver ore comes from new byproduct metal mining and about 1/5th from scrap silver recycling. So we have a situation where about 1 million ounces of silver are being held in trusts by investors and financial institutions. About 1 million ounces of silver are being used per year by industries like solar cell, silver bullion bar and coin fabrication, silver jewelry, and silverware manufacturers. 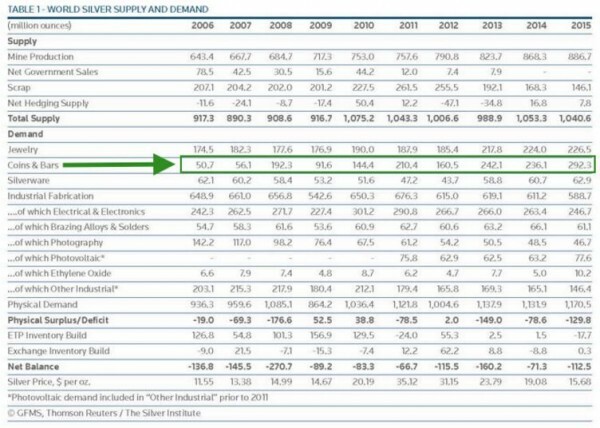 Physical silver supply deficits have become the norm over the past 10 years worldwide. Judging from where prices have been over the past few years, it is hard to believe silver scrap recycling is ready to make up for these ongoing silver supply deficits. 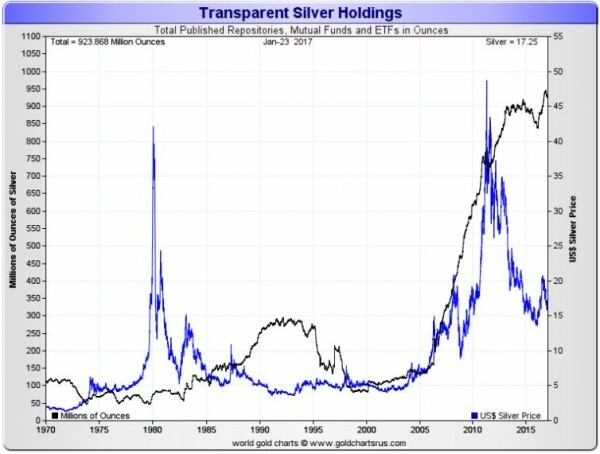 Market fundamental factors aside, let us examine more closely the 3 biggest silver hoards known today. Around the same time silver bullion was hitting its near $50 high in late April 2011, JPMorgan began stockpiling silver bullion in its COMEX warehouse. Although the commercial bank has occasionally allowed registered silver stocks to be withdrawn, the near 6 year trend from nothing to now over 95 million ounces of silver has been steady. 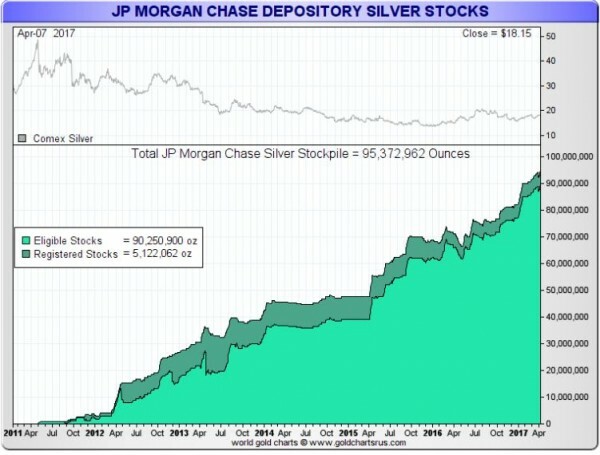 No other silver warehouses on the COMEX have stockpiled silver like JPMorgan. Overall the other five silver warehouses combined have dropped their silver inventories over the same near six year timeframe. 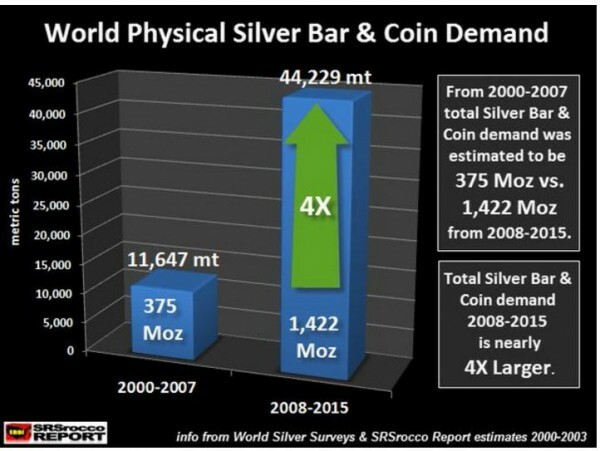 This data has led many silver industry commentators to publicly speculate over JPMorgan’s motivations as their silver warehouse now holds close to 50% of all deliverable silver bullion on the COMEX (the largest silver price influencing commodity exchange in the world). Before we examine the overall silver stockpile of SLV, let us acquaint ourselves with the named parties involved in this silver ETF (exchange traded fund). The SLV sponsor is iShares Delaware Trust Sponsor LLC, a subsidiary of BlackRock, Inc. The SLV trustee is Bank of New York Mellon. The SLV custodian which oversees the trust’s silver bullion stockpile is JPMorgan Chase Bank. The annual sponsor fee is ½ % of the exchange traded fund’s net asset value. This expense is accrued on a daily basis, and paid monthly in arrears. According to a recent SEC 10-K filing the Sponsor earned $25,294,785 USD for 2015 alone. any indemnification or compensation for loss or damages of the SLV Sponsor as described within the prospectus. Finally according to the SLV 40 page prospectus, only Authorized Participants are allowed to deposit or take delivery of any physical silver bullion held within the SLV London warehouse. Physical silver deposits and or withdrawals are done in share baskets each representing 500,000 oz of physical silver bullion. Goldman Sachs Execution & Clearing L.P.
You can find our further commentary on ETFs like SLV and other precious metal proxies here. 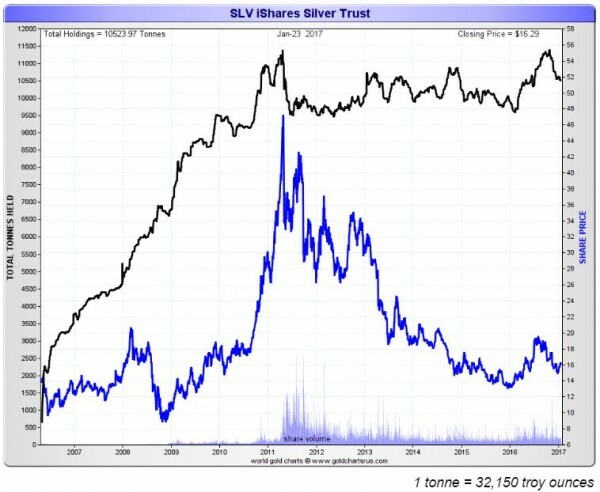 How much Silver Bullion does SLV have? Since launching in late April 2006, the SLV trust has accumulated over 338,000,000 million ounces of silver bullion. Interestingly unlike the popular gold ETF GLD, silver spot price declines from the 2011 peak have not really reduced the amount of silver bullion JPMorgan is custodian of for SLV. Perhaps you have heard or seen some silver bullion buyers at times referring to themselves as silver “stackers”. The growing trend of physical silver bullion coin and bullion bar buying has been rather steady since the 2008 financial crisis. Many of today’s silver bullion buyers are able to sleep better knowing they have some direct wealth outside of the banking and financial system. Often silver bullion buyers would argue the bank and financial sector still requires real structural reforms before trust with their wealth is merited. A large percentage of the silver bullion buying public are avid and disciplined silver buyers. Much of their discretionary cash is consistently sidelined waiting to be used to buy silver bullion, especially during dramatic silver spot price dips. 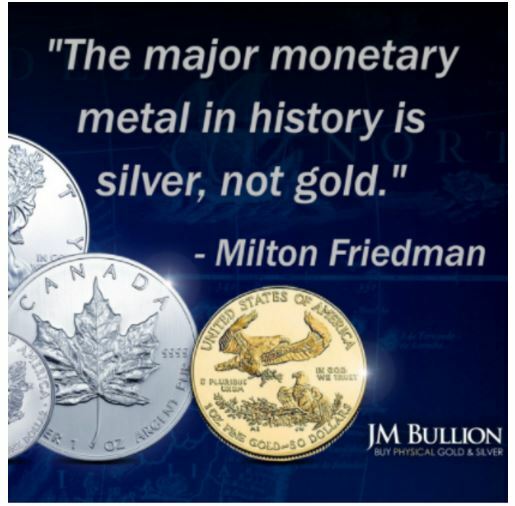 Unlike virtually all government partnered central banks (who buy and hoard about 1/5th of all the gold ever mined), the investing public is today more and more apt to buy and own physical silver bullion over gold bullion for personal monetary savings and reserves. Perhaps due to the amount of troy ounces they get for their cash, or the fundamental factors driving many to believe silver to be more undervalued than gold, the moniker “poor man’s gold” still applies to silver today. Historically silver is the people’s money of choice and that appears to becoming more and more true every year. In 2015, some 28% of the world’s entire yearly supply of silver was used for investment .999 silver bullion coin and bullion bar fabrication. crowd of modern day Hunt Brothers who are actively buying and stacking silver bullion. Just took a look at the four fold demand in physical silver bullion bar and coin buying since Lehman Brothers collapsed nearly taking the whole financial system down with it. Over 1,500,000,000 ounces of silver bullion have been purchased by individual silver investors since the 2008 financial crisis. It is highly likely almost none of the silver bullion has made its way back into world silver scrap recycling supplies since. This trend will most likely remain until either the US dollar price of silver moves exorbitantly higher or somehow those who still mistrust the financial system see large enough structural reforms that they being to move into other asset classes in mass. It is more likely we will need to see a mix of both before this largest silver bullion position ever acquired becomes liquid and traded for industrial fabrication in the future. Just take a look at the four fold demand in physical silver bullion bar and coin buying since Lehman Brothers collapsed nearly taking the whole financial system down with it.